Khokha (Yemen) (AFP) – Twenty Yemeni children huddle together outside Khokha hospital, hoping to be let into a clinic that serves as a lifeline for tens of thousands. On the narrow pavement, a boy dressed in purple leans limply against his mother. In her lap is a baby with expressionless eyes. The hospital, located in a government-controlled western province, is one of the war-torn country’s better-resourced clinics. It receives supplies and aid from the United Nations and donors including the United Arab Emirates, a main ally of the internationally recognised Yemeni authorities. But nearly four years into a war that has pushed 14 million Yemenis to the brink of starvation, even Khokha hospital cannot meet the needs of all the malnourished children who arrive daily. “We take the phone numbers of the patients when there aren’t enough beds for them, and when a case is discharged, we call them back for treatment,” says Abdullah Zuhair, a doctor in the children’s ward. The United Nations calls Yemen the world’s worst humanitarian crisis. The long-impoverished country has been crippled by a blockade, economic collapse and the war between Iran-backed rebels and government forces propped up by a Saudi-led coalition. 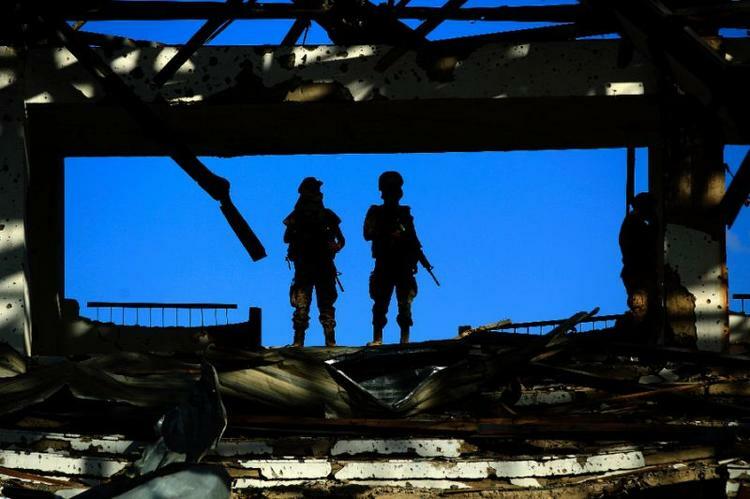 Khokha hospital is located just 100 kilometres — a two-hour drive — south of port city Hodeida, the target of a pro-government offensive against Yemen’s Huthi rebels which has sparked fears of a fresh humanitarian collapse. The hospital serves as the main facility for health services in the district, home to 30,000 people, as well as Yemenis in neighbouring areas. And every day, without fail, new cases of acutely malnourished children turn up for the doctors to treat. Inside the hospital, staff work around the clock, weighing children, taking measurements and injecting nutrients for those too weak to chew. One-year-old Yahia weighs in at 5.5 kilograms (12 pounds) — nearly half the average weight of children his age. As the baby waits for emergency treatment, he cries inconsolably in his mother’s arms. Cartoon characters adorn the walls of one hospital room that is painted pink and blue. Three mothers wearing niqabs, a veil that covers the face, sit on beds with their malnourished babies. “We receive a large number of cases regularly, most of them suffering severe malnutrition,” says hospital director Yahia Zuheir. But the hospital’s seven rooms “are not enough to meet demand”. “We appeal to everyone… to intervene urgently,” Zuheir says. UN agencies say half of Yemen’s population of more than 28 million is at risk of starvation. Twenty-two million Yemenis are dependent on aid for basic survival, the world body says, and the battle for Hodeida threatens to close the country’s most important port. Yemen’s airspace and maritime borders are controlled by the Saudi-led alliance, which accuses the Huthi rebels of smuggling arms from Iran through the country’s ports. According to UN figures, nearly 10,000 people have been killed since Saudi Arabia and its allies joined the conflict in 2015 to bolster the government against the Huthis.